Ghee is an unrefined (clarified) butter historical records of which date back several thousand years. As a culinary gold, it is indispensable in a variety of traditional cuisines and its universal use and numerous healing effects have already been known. 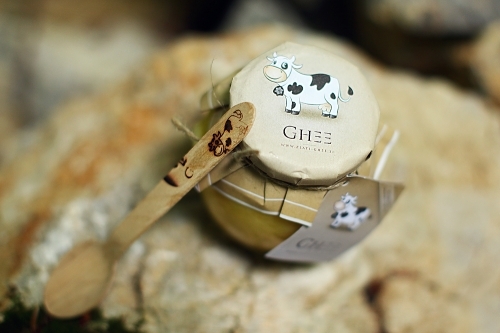 Ghee is an unrefined (clarified) butter, historical records of which date back several thousand years. As a culinary gold, it is indispensable in a variety of traditional cuisines and its universal use and numerous healing effects were already known to our great-grandmothers. 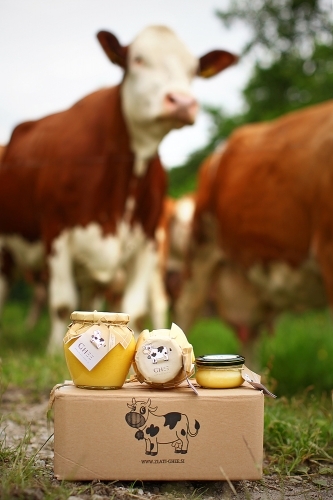 Our Golden Ghee is made of the butter of cows that graze freely on the pastures of the Slovenian Alps. More than 44 hours of careful cooking give this butter its purity, unique flavour and aroma. Its golden-yellow colour and exceptional usability is an ideal alternative and high-quality substitute for many types of oil and fat. 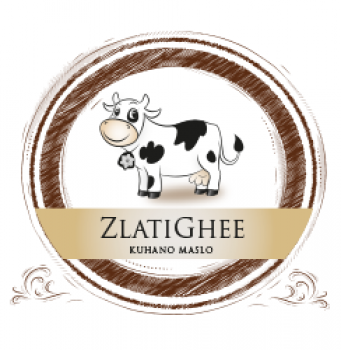 Due to its higher smoking point in comparison with other oils, Ghee is excellent for baking and frying and at the same time also deepens and expands the flavour of prepared dishes. Ghee is an ideal addition to side dishes such as mlinci (Slovenian dish), rice, mashed potatoes, gravies, pasta and other similar food. 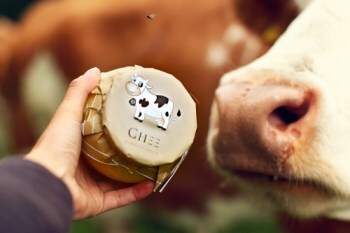 Ghee is wonderful for roasting spice and can also be spread on bread with jam, honey or various other spreads or you can try the spread with Ghee alone. 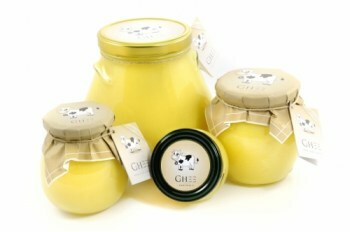 Ghee is also great for the preparation of first-class desserts, pancakes, bread and other pastry products. Ghee is a good digestion stimulant and excellent joint lubricant. It nourishes and strengthens the brain, maintains warmth and vitality of the skin, enhances memory and improves eyesight. 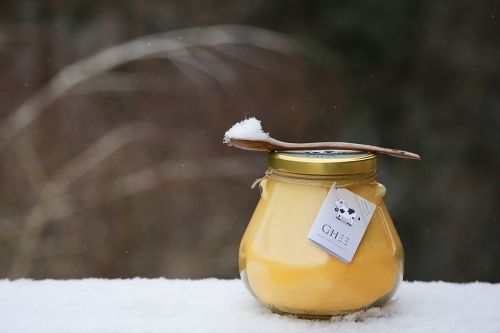 Ghee has anti-inflammatory properties and thus protects health. 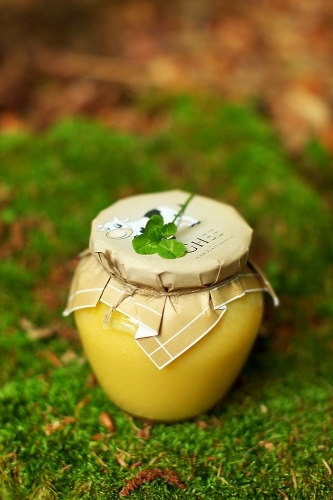 We can say that Ghee is one of the healthiest and body-friendly fats as it does not contain trans fatty acids and does not raise blood cholesterol. 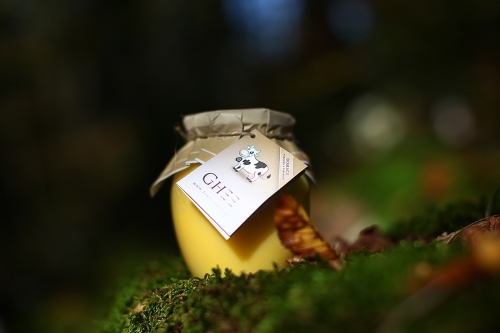 Because of that fact, Ghee is also called the “golden fat.” It is especially recommended for expectant mothers and children. Ghee is suitable for people with lactose intolerance and makes a quality substitute for other dairy products due to its milk essence. Ayurvedic text from the 16th century.